Let me start off by saying I’m a Bob Marley fan. Do with that what you will. No, I’m not Rastafarian. No, I’m not a white guy trying to be cool. No, I don’t sit around and smoke a lot of herb. 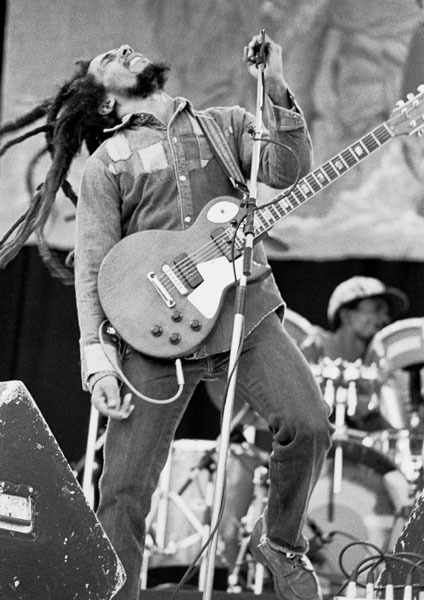 I like music and I like Bob. I like his message and I like what he stood for. I like that he tried to fulfill the greatest commandment to “love God with your whole heart, and love your neighbor as yourself.” It’s tough to find any celebrity that strives for that, especially after fame and fortune hits them. I’m a musician, and as such, I listen to a lot of different kinds of music. There have always been certain artists however that hold a more prominent place in my listening catalog and to whom I have listened more profusely than others. Among those would certainly be Bill Mallonee, Rich Mullins, Phil Keaggy, and of course, Bob Marley. Strange mix? Perhaps, but these are artists who have always impressed me, either lyrically, instrumentally, or both, and have said something to me with their music. Music is interesting in that nearly every culture and every type of people on earth understand it. It’s the universal language. I think that most likely, while I aspire to be able to speak several different languages, I put all my effort instead into writing and playing music. A good artist, like those above, can paint a picture and give you a glimpse into something that words alone can be hard pressed to define, but with music, those words come alive. Music can set moods, change tones, and can transport you to another place and time. It can send a message, reflect on an issue or a person, or calm a weary soul. Bob’s music has always been like that to me. His songs are often simple, with no more than a few chords and easy riffs, but along with the words, they are deep. Simple words and simple tunes are what stick with me the most, and I suspect with most people. It doesn’t matter how many times I hear a G-C-D, or E-A-B chord progression, if played in a certain rhythm with the right lyrics, it’s always catching, and it’s easy to remember. I suspect most people have heard of and most likely listened to a Bob song in their life, and I suspect they enjoyed it. His music has a way of reaching into your soul and speaking directly to the earth of it and stirrin’ it up. I’ve listened to most of his songs and possess most of them, or at least, I thought I did until a wedding I DJ’d this past weekend in Kentucky. The bride and groom chose, as their “First Dance” song, the Bob Marley tune “Thank You Lord.” I looked through my catalog of RNM tunes and to my utter dismay…I didn’t have it. What was this?!? I had to find it! Thanks be to Google for pointing me in the right direction. Turns out it’s on the “Songs of Freedom” compilation album and not a part of other collections or studio albums. I found it, bought it, and immediately loved it. What a song – again, simple, pure, and full of thanksgiving, and it hit me right where I was at and stirred me up, and I gave thanks to God. Given my last two posts I thought it befitting to share this one with you, as not everything is gloomy and difficult, and this song reflects much of what I feel irregardless of what else may be surrounding me. Thank you Wes & Lauren for introducing me to this song, thank you Bob for singing with your soul, and thank you God for the music you put in us all! And now, it’s your turn – sit back, turn up the volume, press play, and close your eyes and be carried away by this simple chorus, giving thanks to God for all things. Have a great weekend! Thank you, Lord, for what you’ve done for me. Thank you, Lord, for what you’re doing now. Thank you, Lord, for ev’ry little thing. I’m just calling on the wise man’s communion. I haven’t learn’t my lesson in Revelation.